Water, Glucose Syrup, Salt, Roasted Onion, Sugar, Onion Juice Concentrate, Spirit Vinegar, Corn Starch, Smoked Sugar, Sea Salt, Natural Smoke Flavour, Natural & Artificial Flavour. 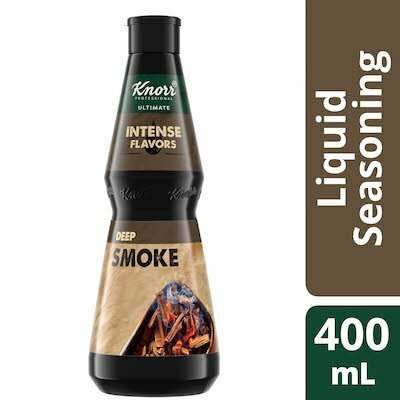 Easily add the deep, smoky flavour of charred American hardwoods to your menu offerings with Knorr Professional Intense Flavours Deep Smoke Liquid Seasoning. Crafted from natural sugar smoked over a variety of hardwoods, this flavouring can add a rich smoky undertone to a wide range of dishes--including pan-fried steak, burgers, and grilled salmon. Use a large quantity to deliver a distinct barbeque-style smokiness or add just a dash to bring out warm, rich flavour notes. This liquid smoke flavouring is made with authentic ingredients using real culinary processes, giving your commercial kitchen access to complex flavours that are otherwise difficult to achieve. And thanks to its versatile liquid format, it can easily be added at any stage of the cooking process. Choose from a wide range of Knorr Intense Flavours to increase efficiency in the kitchen, reduce costs, and meet your clientele’s demand for unique and complex flavours.